6th grade math can be quite challenging! But with a host of free online math games for 6th graders, it can also be very interesting. The cool math games in the virtual world here at Math Blaster are the perfect combination of learning and fun. 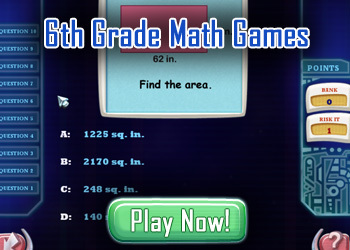 Engage 6th graders with these math games and watch them grow to love the subject! 6th grade can be an academically challenging year. Whether the kids love math or hate it, they have to learn a lot of advanced concepts to keep up with the class. Generally between 11 and 12 years of age, 6th graders have to learn certain complex math concepts. If they have a good foundation in all the concepts taught till Grade 5, they will be able to grasp the new ones with ease. There are certain math skills that kids should have before starting 6th grade. In this grade, students get a better understanding of geometrical shapes and can classify triangles and calculate their missing angles as well. Apart from knowing complementary and supplementary angles, 6th graders learn ratio and proportion, evaluate formulas, solve two-step equations, learn probability and permutations and combinations, and calculate mean, median and mode. It is easy for some 6th graders to be overwhelmed by the sheer volume of new and advanced concepts that are introduced to them. Encouraging them solve problems and practice math is probably one of the most important ways to ensure that they have understood all the concepts well. The availability of a wide range of online math games also makes it easier for 6th graders to not get intimated and try their hands at tough math problems. The virtual worlds at Math Blaster and JumpStart are filled with all kinds of cool math games for kids of all ages. Get them hooked to these games and watch them pick up and learn new concepts with ease. A great way to practice math and to develop a love for the subject, these math games will make math fun for 6th graders!